Employees Provident Fund (Karmachari Sanchaya Kosh) applied the new interest rate 8.25% on the deposited amount and 9.50% on loan. There are different rates on different loans. 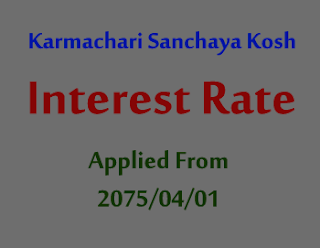 New Interest Rate Karmachari Sanchaya Kosh applied from 2075/04/01. As they published on their official site there is the new system to take loan also. The depositor can take 80% of the deposited amount as loan. Check details on New Interest Rate Karmachari Sanchaya Kosh below.